I ran nine miles today for my long run. Once again, I was running late and had to sprint out of the house to make it on time. I am going to have to work on this when the run gets even longer. Our group had eight runners today. The weather was great. It was not too warm and it was lightly raining for the first three miles. My legs were pretty tired from the track workout so I was really happy to start the run off slow. 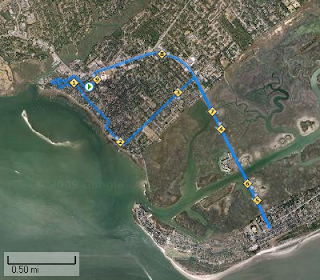 We went through the Old Village up Center and over to Sullivan's Island. Then we came back Coleman. The first mile was nice and slow (12:06). We increased the speed on the next few to around 11:00 pace (11:04, 11:07, 10:51). After we went over the bridge to Sullivan's Island we increased the speed to around 10:00 pace (10:35, 10:13, 9:50, 9:52, 9:53).